Spotify isn’t working “The Spotify application is not responding“. 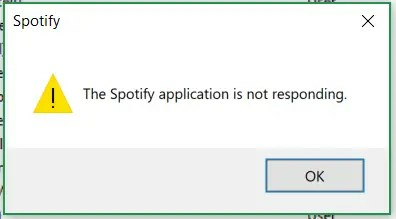 The Spotify application is not responding. A wait and restart of Spotify did not solve anything. Very frustrating if you have a lot of applications open during your work or studying! Music is simply a must 😉. I don’t want to restart my PC. We’ll let’s fix it then without restarting your PC. Before we proceed on how I got the message, let me first show you how you can solve it. What I tried first was to open Task Manager and ‘End task’ Spotify. Unfortunately, this did not solve anything. While it seemed like Spotify was closed, but maybe you, just like me, have the ‘minimize’ option on when you ‘close’ Spotify. By closing Spotify in Task Manager it automatically becomes a background process. So to resolve this, Search the list Background processes for Spotify and end the task here also. Explain it to me in Dummy language. Go to start and search for Task Manager, or right click your Taskbar and click on Task Manager. 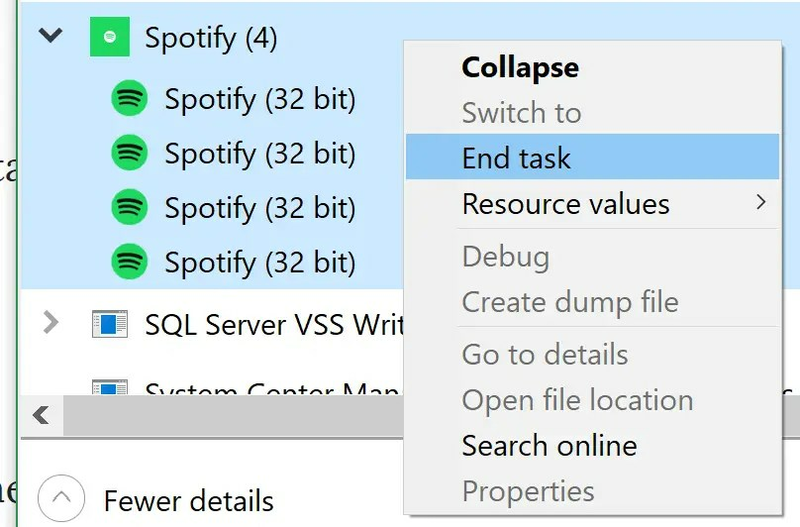 The Task Manager will show a list of active Apps and Background processes. First right click on Spotify in Apps and click on End task. Now search for Spotify in Background processes as well and perform the steps again. What broke Spotify for me? I use two headsets during my daily work. One is for music and the other I use for telephone calls. When I wear the telephone headset all day long, I get a headache. I had connected the music headset before I had removed the phone headset. As a result, Spotify stopped responding.